US rider Lauren Kieffer was just pipped for the Rolex Kentucky Three-Day Event CCI**** title by World number one eventer William Fox-Pitt and Bay My Hero, but has been awarded the Pinnacle Cup Trophy for her ride on Veronica. The trophy goes to the highest placed US rider at the Kentucky Three-Day-Event, and Kieffer joins an illustrious group of riders to have won. Veronica is a 12-year-old Dutch Warmblood mare owned by Team Rebecca, LLC. Although Kieffer took over the reins from Karen O’Connor only a year ago, the duo has already developed a strong partnership. At Kentucky, they finished with 46.7 penalties in the dressage phase and continued to move up the rankings after completing a clear cross-country phase. The pressure was on when they returned for stadium jumping on the final day. 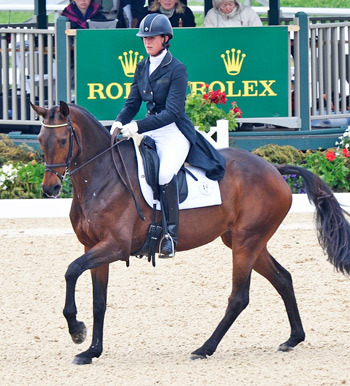 They completed a double clear round to finish on their dressage score, taking home the second place honors overall behind Fox-Pitt, and earning the Rolex/USEF National CCI4* Championship title. “I am thrilled,” Kieffer said. “Veronica could not have gone any better. It’s what we work for every day for years and years, and other riders have worked just as hard, if not harder. I am thrilled that it happened to be my day. Looking ahead, Kieffer is heading to the Jersey Fresh International Three-Day Event next, where she will be riding Jacqueline Mars’ RF Cosima and Shannon O’Roark’s Lucky Devil. Before this, the top US finisher was awarded the Gladstone Challenge Trophy.